Popular Catholic blogger and speaker Sarah A. Reinhard presents the first book to accompany expectant mothers from conception to baptism with weekly reflections and prayers rooted in the mysteries of the Rosary and related to the baby's physical development. Designed to help expectant mothers embrace pregnancy as an opportunity for spiritual growth, A Catholic Mother's Companion to Pregnancy prepares mothers for the trials and joys of pregnancy, childbirth, baptism, and, ultimately, motherhood. Each week of pregnancy is paired with a mystery of the Rosary, a personal, down-to-earth reflection from Reinhard, advice for living the sacramental life, and a prayer to help the reader grow in faith as she bonds with her unborn child. When I was pregnant with my first child (who is twenty now), I read What to Expect When You Are Expecting and some book that had film plastic overlays showing how the various systems in the baby's body developed. I suspect I got some other books about pregnancy and childbirth from the library(this was before my internet days). I was blissfully happy being pregnant (at least until morning sickness hit) and wanted to know all I could about this wonderful process happening inside me. When I was pregnant with my third, my dad gave me a book for Christmas--The Girlfriend's Guide to Pregnancy which was much better considering the attitude I had at that time. One suggestion in that book was to stand on the scale backwards and tell the nurse you didn't want to know your weight. They said that if your weight was a problem, your doctor would tell you; if it wasn't, you didn't need to know every pound if it just made you upset. Anyway, while these books were good for telling me what was going on inside my body (or in the case of The Girlfriend's Guide, commiserating with me) they didn't prepare me to be a Catholic mom. 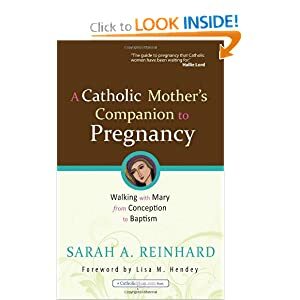 Sarah Reinhard's A Catholic Mother's Companion to Pregnancy covers the nuts and bolts of pregnancy and helps a woman prepare spiritually to be a Catholic mother. There are books that give more vivid descriptions of fetal development but this one is adequate for most people, giving the size of the baby each week by comparing it to common items (as big as an eggplant) and some developmental milestones. Chapters include articles about our faith, about mothering, about pregnancy or about family life. Also, as noted above, Sarah takes a different mystery of the rosary every week and writes a meditation relating it to pregnancy. For example, for week 24, the mystery is the Annunciation and the mediation talks about not being afraid. 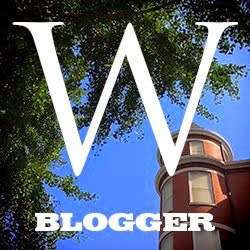 I loved an article for week 27 that talked about how much stuff you really need. Like me, she found that you don't need near as much as what you have for the first baby. The Faith Focus section of each chapter introduces some traditional Catholic devotions, tells about Saints and teaches you prayers. If you know a Catholic woman who is expecting a baby, A Catholic Mother's Companion to Pregnancy would make a wonderful gift. Grade: B+. I'd like to thank the publisher for making a review copy available via NetGalley. I was not obligated to write a positive review. I have linked this review of A Catholic Mother's Companion to Pregnancy to the free Catholic Book review program, created by Aquinas and More Catholic Goods. Aquinas and More is the largest on-line Catholic bookstore. While they did not send me a copy of this book, they will promote this review and credit me with points I can use toward future purchases. Great review. I have just started reading it. Wish I'd known about this one earlier in my sister's pregnancy; she's only a few weeks out now. Well, its a brand new book--maybe for the next baby! Sounds like I will be looking at this one for Jen. Fourth baby seems to be sticking around for the duration. Six weeks so far! Her spirituality seems to be picking up pace as well.